Here you can read Ron Hood's on-line book, Survival, The Last Laugh. Four chapters are ready for you now, and more are on the way! 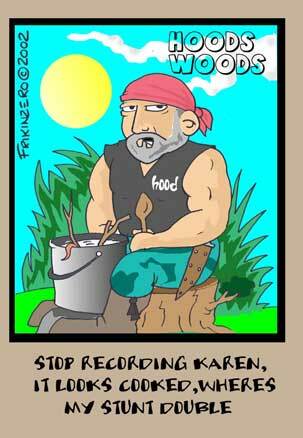 You will also find informative articles about the "How-to" of survival, Karen Hood's Survival Journal (with pictures! ), instructions for building the amazing Firebed, and more. Karen's Emergency Preparations article is here! Read a few of the Woodsmaster videos national magazine reviews. If you have our videos, you may need this Resource List! Read Karen Hood's Survival Journal This PG rated narrative of Karen's week long solo survival experience should really tickle your funny bone! The Battle Mistress knife review in American Survival Guide is no longer available. Introducing Your Lady to the Woods If you want a new trail buddy, bring your Lady! But do it the right way. Karen Hood gives you a woman's perspective on how to introduce your lady to the wilderness. Learn how to build a FIREBED! This is a post of an article Ron wrote for the fascinating Backwoodsman Magazine. It explains how to build an amazing life saving fire warmed bed. What the Heck is an "Andragogy"? Every school has a philosophy of education. Learn a little about the concepts that drive our educational programs. Bug Muncher's Information Did you find a bug in your cereal? Don't toss it! It may be the best part of your meal! Backpacker's John Viehman Munches Maggot and lives! When Ron was chosen by PBS and Backpacker Magazine to take John Viehman on a little journey to hell, one of the stops was a pile of maggots... Ron leads Anyplace Wild host and Executive Editor of Backpacker Magazine, John Viehman, on a week-long wilderness survival training experience. This incredible journey has been airing on PBS's Anyplace Wild and has proven to be one of their most popular episodes! There are a lot of talented folks in our Hoodlums forum. In this section of the library we will keep some of the interesting material that we find posted in the forum. If you have questions about the material please contact the author of the piece. As a starter we have included some very advanced survival kit designs. These kits are here because we challenged the Hoodlums to come up with survival systems that would fit in the pocket of a Becker BK7 Knife Sheath. If you follow these directions you will see that you have a very robust and inexpensive survival system. Shortly we will have three more articles about kits based on the Becker blades... We think you'll be delighted. The next two articles are the work of friends ours who have some special expertise we think is valuable in a survival context. Soon we will have a bunch more articles for you to enjoy. In the meantime you will find it worth your time to join the Hoodlums Forum and get that extra bit of knowledge that can only be found in a community of wilderness friends and colleagues. Perhaps YOUR writings will end up here! Rants, Ravings and Other Drivel! What's this? Sometimes we have questions that are difficult to answer, because almost any answer is sure to offend someone. You will certainly find some offensive (or humorous) discussions here. Here are some sundry ravings of a man and his friends who'd rather sleep on the dirt than accept a politician as human. If strong language offends you, stay out!